When Concord residents Corey Peck and Kristin Baker gave in to their daughter McKenna’s pleas to build a backyard chicken coop, they weren’t sure what to expect. Neither had kept chickens before. Did they have the time and energy to take on a new family project? Would their children maintain interest? But now, more than a year later, the couple wouldn’t give up the experience of cooking their own fresh-laid eggs for anything. And they’re happy to share their experiences and bounty with friends and neighbors. The couple owns eight laying hens, which include some Plymouth Rock stripped breed and a brown-colored Star (along with some possible black Australorps). The hens are housed in a homemade coop underneath a deck in their shady backyard. Now that the hens are established, they require surprisingly little care. “We make sure we give them water and feed in the morning,” Corey said. “In the summer, we keep the coop windows open to provide ventilation and keep the hens cool.” An electric light provides heat in colder weather. Corey and Kristin liked the idea. Both are environmentally aware and enthusiastic about moving toward a more sustainable lifestyle. Corey’s building career has included “green renovations” and projects incorporating geothermal heating. Kristin is a research assistant professor at Boston University’s School of Medicine. Her work focuses on nutrition and exercise. They consulted a friend, Kim Denney, at Chestnut Farms in Hardwick, where the couple has a share in a meat CSA. (The farm supplies organic, grass-fed beef, poultry, pork and lamb.) Denny gave them tips on raising hens. She also said that she had so many chicks she could give them some to start. 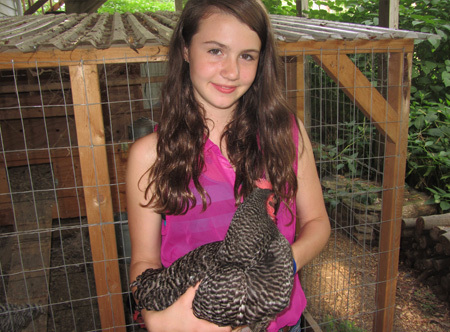 So Corey and Kristen went to the farm and Denny gave them fifteen chicks. Corey built a chicken coop over a weekend, spending about ten hours on the job. As a builder, it took him less time than it would an average person, he said. He spent about $260 on materials. After an initial rough time – Corey attributes the death of seven chicks to a riboflavin deficiency – the chickens began to thrive. By the fall, several months after their July arrival, they were ready to lay. A short “training” period followed. “At the beginning, they were laying all over the place. They didn’t go up to the nest.” So Corey had to encourage them to lay eggs in the nest. “They say lots of times you can put a fake egg in to show them what to do,” Corey said. “I put two golf balls in there.” It worked. Corey talked with the staff at Erikson Grain Mill and Acton and chose a feed mix that produces eggs rich in omega-3 fatty acids. For $15 a month – the cost of a bag of feed – the family gets all the eggs they can eat and have plenty left over to share with friends and neighbors. The family also has a plot in the community garden at neighboring Cousins Field. “Last year we were awash in tomatoes,” Kristin said. She said this year the couple has paid less attention to the garden plot, “It’s maybe one project too much for now.” For the future, however, she wants to learn to preserve their garden produce, maybe even venture into canning. Having fresh eggs easily available has changed the family’s eating habits. “We never have to worry about what to have for dinner if we haven’t gone shopping,” Kristin said. “We’ll have an omelet, or we’ll toss some eggs into fried rice, or do an eggnog or a quiche. Caleb likes to have ‘breakfast for dinner’ nights, so he’ll have scrambled eggs sometimes. Kids tend to be carbohydrate-hungry, and the eggs work well” in getting protein into children’s meals. A favorite family recipe is kale and eggs. “We sauté the kale with a little chicken broth. Then when it’s done we break eggs into the pan and let them poach,” Kristen said. She serves the kale as soon as the eggs are done.